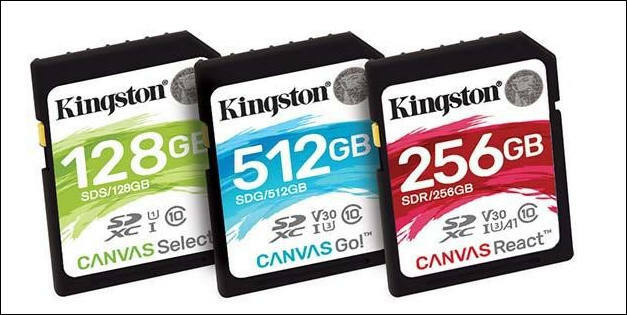 Kingston Digital, Inc., the Flash memory affiliate of Kingston Technology Company, Inc., a world leader in memory products and technology solutions, announced today its new series of 'Canvas' Flash memory cards. Canvas will offer three different variations in both SD and microSD cards: Select, Go, and React to suit consumers' needs. With the Canvas line of memory cards, users and creators can choose the best storage medium available. The cards are designed to provide the reliability, flexibility and performance needed for any project. Along with tested durability, users will have the confidence to bring Canvas cards wherever their imagination takes them. For on-the-go shooters making it ideal for filming life's adventures in 1080P or even 4K on DSLR, drone or action camera. Class 10 UHS-I U3 speeds1 up to 100MB/s read, 80MB/s write. SD in capacities2 up to 256GB and microSD up to 128GB. "We are always determined to create new and improved storage solutions that meet our customers' needs," said Annette Chan, Flash card business manager, Kingston. "Canvas Flash cards are durable, high in storage capacities and have fast transfer speeds to capture all of life's memories anywhere." Canvas Flash cards are backed by a lifetime warranty, free technical support and legendary Kingston reliability. For more information visit http://www.kingston.com .